There 's nothing more frustrating than doing a full exterior detail and not being able to get your tools into those small, but filthy, hard to reach areas! Get down and dirty in even the smallest cracks and crevices with the Chemical Guys All in the Details Exterior Detailing Brushes. The premium boar head bristles are strong enough to dislodge even the toughest set-in grime, but soft enough not to scratch your car 's paint or polished metal finishes. Emblems, thin wheel spokes, and slatted grilles are some of the trickiest places to clean and can drive even the most patient detailer insane. Now, you don 't have to have the smallest hands to clean all those hard to reach areas, just let the Chemical Guys All in the Details Exterior Detailing Brushes reach all those difficult places where your big mitts can 't fit! Have you ever seen a car that looked pristine from afar, but closer inspection revealed dirt and debris stuck in the emblems, exhaust tips, and small wheel spokes? It 's the details that matter, so quit ignoring those difficult to clean cracks and crevices just because you can 't reach them. Chemical Guys All in the Details Exterior Brushes come in three different sizes because when it comes to detailing, one size doesn 't fit all. Like painting, detailing is an art and the Mona Lisa wasn 't painted with a single brush. It was executed with a variety of different sized brushes, and likewise, you will need an assortment of brushes when detailing depending on the task at hand. 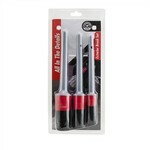 Use the small brush for the tiniest hard to reach spaces such as lug nuts, the medium sized one for emblems, and the large one for grilles, engine bays, and exhaust tips. The premium boar hair bristles easily fit into rounded corners, slim openings, and along contoured surfaces to lift away deeply embedded filth. 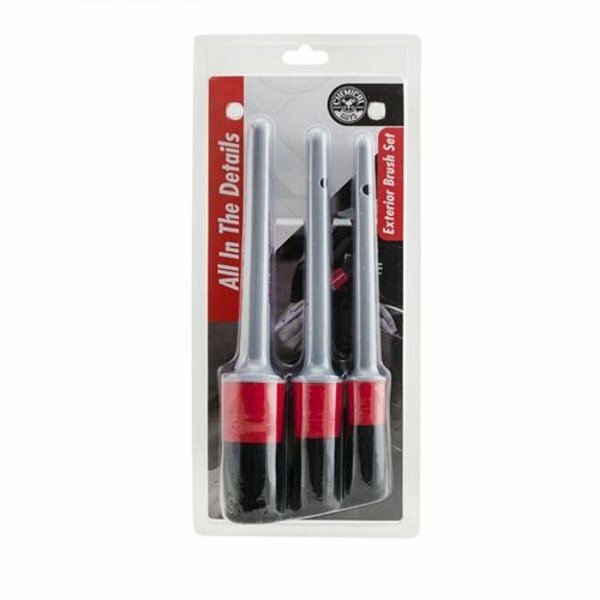 All in the Details doesn 't just mean that these brushes will clean the smallest and most inconvenient parts of your car, it means that we 've thought of all the details on our end too when designing these brushes. 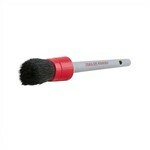 We engineered these brushes with no metal parts to reduce chances of scratching exterior surfaces. 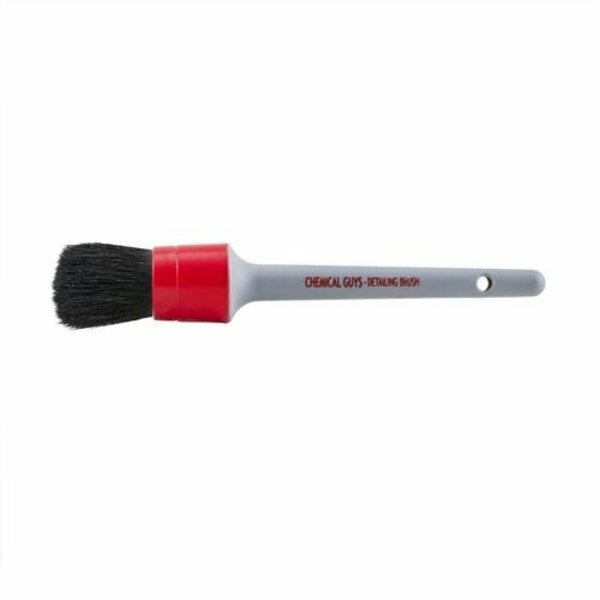 The plastic chemical-resistant handle means these brushes won 't rust or corrode like metal, and won 't swell or rot like wood when wet, making them a durable choice and a solid investment to add to your detailing arsenal. 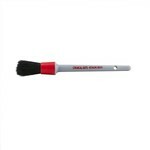 The high quality plastic construction also ensures the brushes are light and easy to maneuver in the tightest and toughest spots and don 't require the death grip of a gorilla to keep from falling out of your grasp. Sometimes, cleaning those hard to reach areas is more of a delicate balancing act rather than an exercise of brute force and requires just the lightest touch and most agile caress. 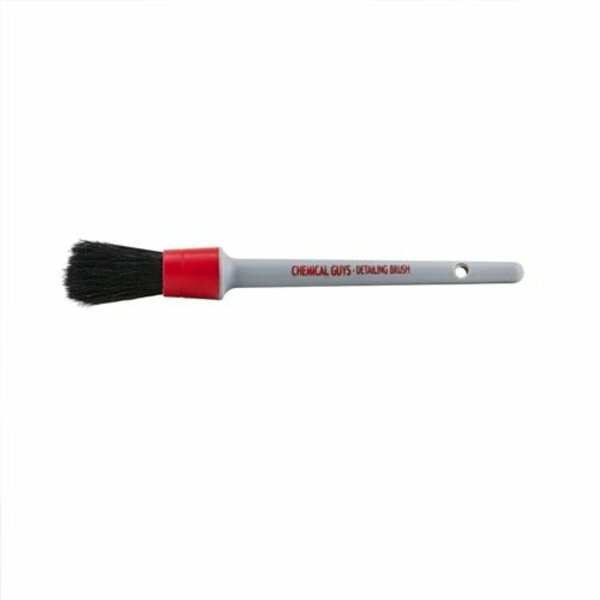 The premium boar hair bristles are super soft and gentle to reduce the chance of scratching your paint, metal, or any of the various sensitive surfaces found on the exterior of your car. Compressed air just doesn 't cut it sometimes and eventually runs out. Power washers are great for large areas, but can 't provide the precision needed for small areas, and getting too close with such powerful force could do more harm than good. Wriggling your hand into those hard to reach areas with a microfiber towel may be possible with a great deal of effort and patience, but extracting your hand will inevitably result in more cuts, bruises, and scratches than your cat Sprinkles gave you last time you tried to give him a bath. Stop neglecting those hard to reach areas simply because they are difficult to access and get the right tools for the job with the Chemical Guys All in the Details Brushes. The long chemical-resistant handles make reaching even the tightest places a breeze. 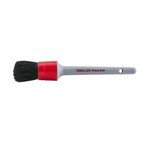 The black bristles ensure that the brush won 't stain even when you 're cleaning the dirtiest places, like your wheels, engine bays, and exhaust tips. Now that the exterior of your car is looking truly immaculate with all cracks, crevices, emblems, and grills in like-new condition, what do you clean now? The interior, of course! Tackle that filthy interior with the same ease and precision with the All in the Details Interior Brushes. 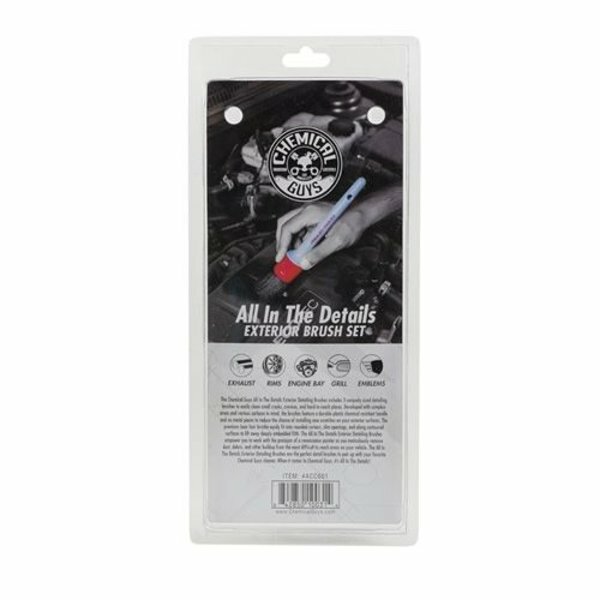 The premium synthetic blend bristles are strong enough to dislodge even the toughest set-in grime, but soft enough not to scratch your car 's interior finishes. Vents, seats, cubbies, buttons, knobs, and steering wheel emblems are no longer difficult to clean with the Chemical Guys All in the Details Interior Brushes!